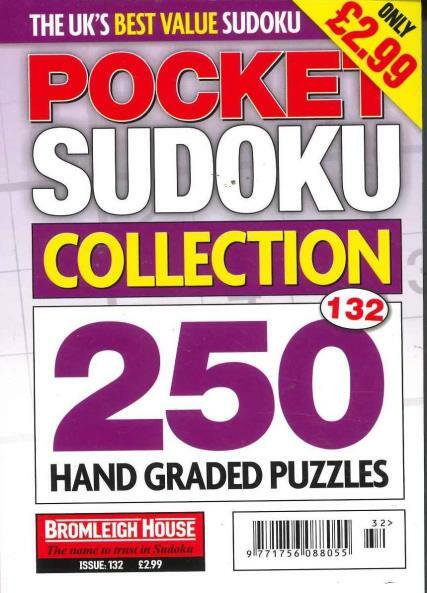 For sudoku fans who like to complete a number of different puzzles every day, Pocket Sudoku Collection provides exceptional value for money. 250 puzzles every month in a handy pocket size format with all grids consecutively graded from easy to hard. Pocket Sudoku an ideal size of print, two per page and an ideal travel companion, easily fits in a pocket. Thank you. This is my third yearly subscription to this magazine and I am well satisfied. Relaxing doing the puzzles. Helps me unwind. Very good collection.